Our regular readers certainly know what is Nakivo Transporter for, but readers who just discovered our blog might not be so sure. 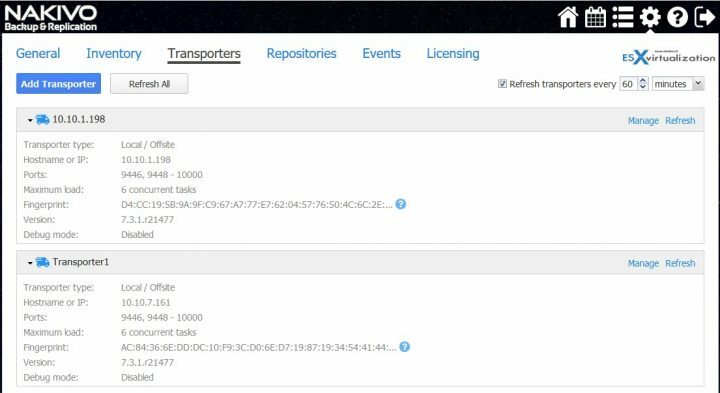 In this post we will detail the role of Nakivo Transporter component and show the specification and configuration options. Nakivo Backup and Replication is a product which can backup VMware vSphere and Microsoft Hyper-V environments. A built-in replication allows setting up disaster and recovery plans to another remote site or to the cloud. Additionally, Nakivo product can be installed on many supported NAS devices for better efficiency. As mentioned, this post will focus on Nakivo Transporter. Before starting, worth to note that Nakivo main component is called Nakivo Director, which has the main UI, DB etc. Nakivo Transporter is bundled together with the Director or as a separate download. The separate download is useful when you want to add an additional transporter to your existing site. Transporter is the “worker”, it is the piece of software which actually does all the copying (backup), pushing the bits from point “A” to point “B” (replication), compression, deduplication and encryption. It does the heavy jobs. So if you have a lot of VMs to proceed, you need several Nakivo transporters within your environment. One Transporter can simultaneously process multiple source disks (6 by default) during backup, replication, and recovery. If jobs contain more disks than the Transporter is set to process simultaneously, the disks will be put in a queue and will be processed once the Transporter frees up. The idea is to have multiple transporters so you can process more VMs at once. It’s as simple as that. How to Add another Nakivo Transporter to your environment? Fairly simple. You need to download the component and deploy it to your environment. The deployment process is simple and consists of deploying and configuring the IP address of the Transporter component. 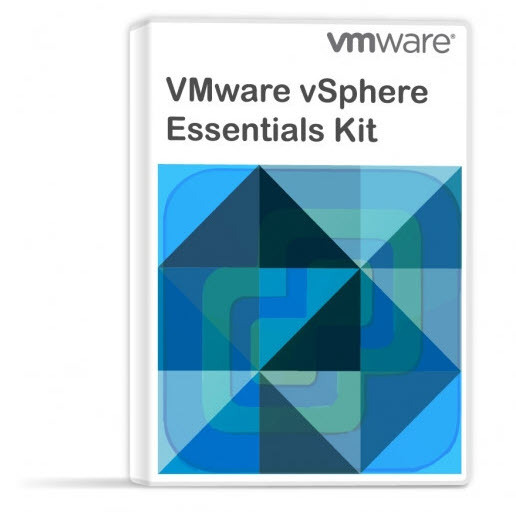 (Its a VM). So when on the trial download page, simply select Virtual Appliance > Other Virtual Appliance Options, and from the pop-up window pick the Transporter. Once downloaded, deploy and configure the IP address (through the console). And then Add it to your environment through the Nakiov main console. You’ll need to go to Transporters TAB > Add Transporter > Add existing Transporter. And then enter its IP address. You can also hit the More Option Link which uncovers few more options concerning networking (you can change ports) and you can personalize the transporter’s name and change the number of concurrent tasks (6 by default). So at the end, you’ll end up with an additional transporter in the list of all transporters within your environment. Here is a screenshot from my lab. Remember that by default when deploying the All-In-One OVA in VMware environment, all the components are there, including the Transporter. So you don’t have to worry about where to look for it. It’s only in a situation when you need to process more VMs or if you have DR site. Really? A DR site needs transporter? Yes, it does. Here is a screenshot from Nakivo Help center showing the architecture. The transporter plays an important role here as it uses network compression and encrypting when sending data over to the remote site where another transporter decrypt the data and stores them in a local repository. Deploying multiple Transporters also enables network acceleration and AES 256 encryption of traffic between a pair of Transporters. For example, if VMs are replicated over WAN between two sites, the Transporter installed in the source site can compress and encrypt data before transferring it over WAN, and the Transporter installed in the Target site can decrypt and decompress the data prior to writing it to the target server. Here is an example of the architecture where you have 2 sites. By default, the product automatically determines which Transporter should be used based on proximity of a Transporter to the source or target server. But you can manually override the selection on a “per-job” basis. It means you can specify which transporter is used for which job, if you want to, but te product can do pick automatically the best transporter to read the data from the source VM. Where to Change the Transporter? During the New Job creation wizard, when you are on the Options page. Automatically determine source transporter: The product will automatically determine which Transporters are the closest to source hosts (the hosts that run selected VMs) and will use those Transporters to retrieve data from source VMs. Set a source transporter for all VMs: Select this option to manually specify a single Transporter that will be used to retrieve data from source VMs. Manually set transporters for source hosts: Select this option to manually specify which Transporter should be used to retrieve data from each source host. Well, this is it about the transporter component. As you can see, it’s fairly easy to understand, deploy and configure. Nakivo can be installed on Windows system (physical or virtual), Linux (physical or virtual), but it’s also distributed as a virtual appliance for VMware (OVA file) or Hyper-V or as an installation package for certain NAS hardware. Not even mentioning cloud options such as Amazon AWS where you can back up AWS EC2 Instances by creating a backup job that specifies which Instances should be backed up, where the backups should be located, how often the backup should occur, and what backup options should be used. Nakivo can fit for small or larger installations. For larger shops, you have a choice to create a distributed architecture where you need to install the Director (the main Nakivo product) and Transporter on one site (main site), where at least one Transporter will be installed on every other site that you want to backup/replicate. Check Nakivo website for further details. good article. I’ve been trying Nakivo as a replacement for Veeam and wanted to add another transporter on another ESX host. Thinking I could save some time I tried just copying the original transporter vm files to the other host and registering the machine in the usual way. However, if you attempt this you will find that Nakivo gets confused as you cannot add this copied transporter vm because it thinks the transporter already exists. I did try hacking around the copied transporter and found a guid lurking in /opt/nakivo/transporter/bhsvc.id which I changed to a new one (bash uuid) and rebooted but no luck. So, in the end I had to use the original Nakivo ova vm deployment package. No big deal. Just interesting to try.